There is a bitter pleasure to encountering the work of a “new” poet – enjoying and even loving their work – only to learn that the poet is deceased. The poems then take on an eerie glow, backlit by the knowledge that the work serves as both monument and memento of who this person was, how and where they lived, and why they wrote. The sensationalist will be instantly on the watch for moments of deathly prescience. The humanist looks at the photograph of the vanished poet on the back cover and searches that face for flickers of hope and dignity. The moralist frames the work as an argument with death, an argument that can then be applied to the self: “do not go quietly unto your grave,” Mark Sandman once sang. The truth is that the literal death of an author calls into question the still-popular theories of Roland Barthes’ “The Death of the Author.” There is a living, breathing, thinking, feeling individual consciousness composing the work. Or, there was. The change in tense makes the contradiction of presence (the work) and absence (the fact that the author has died) all the more palpable. The poetry world lost a bright source of formal and emotional dexterity when Elise Partridge passed away in 2015. 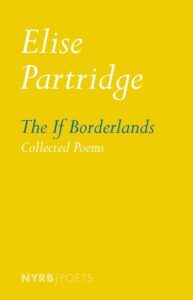 The If Borderlands collects all of the poems that Partridge wished to see published, including her three full-length collections plus a modest but mighty selection of previously uncollected, and in some instances, previously unpublished, poems. Her first book, Fielder’s Choice (2002), introduces a sensibility where the human longs to be of the natural and vice versa. The closing lines of “Everglades” highlight this rift (“A bird swaying on a coral bean / sang two notes that might have been ‘Name me.’”) with a nod to the Biblical tale of Adam naming the animals. Partridge’s early poems in Fielder’s Choice deftly explore the dividing lines of man and nature with a subtle wit and a healthy dose of wonder at the patterns of reality. The poems are pastoral and sometimes nearly Edenic, yet they are also acutely attentive to the human figures, and their roles and presences in the landscapes, that, if not innocent themselves, certainly border a region of innocence. The book’s second section travels away from these themes into elegiac poems about death and the afterlife; poems like “The Secret House,” which explores the metaphor of death as a house one enters through a series of vividly imagined locales: “maybe it’s the farmhouse off the highway / with a roof like a squashed hat, / a stoop defended by blackberry bramble.” Nature once again plays a role as an active presence in the poems. Here and in nearly every poem of her career, Partridge performs one of poetry’s primal tasks: to reimagine the world for the reader. It’s trendy to posit that so-called “formalist” poetry is intricate to the point of being ornamental, perhaps safe, maybe showy, and susceptible to sentimentality. Recently reencountering the poetry of Bill Knott, I was reminded that the opposite is just as likely true. To plow the field of form (in the classical/traditional sense) means to constantly innovate in the face of the given conditions. Partridge smartly embraces the tension the contemporary ear hears (or listens for) when confronted with end rhyme. Her body of poetry displays an interesting and continuous juxtaposition of metrically precise rhyming poems alongside no-less-precisely rendered free verse. In “Ways of Going,” from the second section of Fielder’s Choice, Partridge actively resists both the end rhyme and weekly iambic construct of “by the dip of an oar” by instead writing “Sad rower pushed from shore, / I’ll disappear like circles summoned / by an oar’s dip.” There’s an attention to both music and taste in this choice, and it serves as a reminder that form should serve the poem, not the other way around, a maxim that Partridge upholds across the span of her poetic endeavors. As Fielder’s Choice unfolds, Partridge continues to challenge our sense of what constitutes form. “Insights” mulls over the often inconvenient timing of consciousness: “the plates of your being tilt / relationships may quiver / like parts of a mobile trembling / into a new suspension / the fine guy-wires / tethering you to your current life / are loosened”. The lack of punctuation is unsettling, but Partridge manages to tame it with carefully placed spatial breaks on the visual field of the page. In the same poem we’re shown “the butterfly that applauded on your blistered toe / when you were straining up that mountain” but Partridge only skirts cutesiness before heading immediately toward deeper waters, though the reader often feels teased by the poet’s lilting oscillations between tones and symbols. This trend continues with whirling, associative poems that flirt with synesthesia and emotionally charged suspension of “the real,” as in “Inspiration,” where “One day a scent that had been folded softly away / beeps / through later avalanches of ephemera, // the rare varied thrush / ‘usually seen only at higher elevations’ / flashes its orange / throat in your maple / long enough for a few notes to be transcribed”. After shimmering lines like these, Partridge is free to float from subject to subject, be it ars poeticas, ancient ruins, rural museums, or notes taken during some of Robert Lowell’s final lectures at Harvard. Fielder’s Choice ends with the poem “Odysseys,” which manages to combine many of the strands woven through earlier poems in the collection via the larger metaphor of reading and study: “I never lingered in the reading room / on cracked leather chairs, under varnished portraits, / but rapelled [sic] directly into the stacks’ ravines.” Although it plays on a contrast with the more nature-oriented poems of the book’s beginning, “Odysses” musters an homage to knowledge that brings Fielder’s Choice to a moving conclusion. with bullet trauma to ribs or skull. rousing spectators with now-lost chants. The drains at the bottom might have caught blood. I don’t know of any other poetry like this. Partridge’s ability to combine the purely imaginative with the sociopolitical is bracing. This mix of registers and subjects shines again in “If Clouds Had Strings,” a surreal, fantastical poem (“If hoarded for personal grief / or rich children’s kites, / perhaps a grassroots co-op / could assemble thousands / for launching – relief”) that ends with a moment of pop noir straight out of Edward Hopper, or maybe Tom Waits. A cloud has been “snagged by the truck stop” and when the waitress’s “shift ends, / she strides through the parking lot / and snips its soiled tether / with the night cook’s shears.” This acute image-work continues in pieces like “Big Pink,” where Partridge responds to a photo of legendary rock ensemble The Band and imagines them hard at work in the studio before their rise to fame. In “Last Days” Partridge cuts sentimentality with specificity and unblinking consideration of death: “Three days later, / your gray eyes glazed, / blank. We stroked your hands. / What could wrench you down? // Your daughter’s walking now.” The last several poems of The Exiles’ Gallery offer shimmering reminders of both life’s pain and beauty. Partridge does not shy from emotional complexity, but instead always wields a sense-stretching diction within traditional modes of poetic composition to transport that complexity to the reader. The handful of previously uncollected poems that close out The If Borderlands only intensify the sense of a poet who left us too soon. “Bird Singing at 3:30 a.m., Earth Day” asks “Are you straining / to haul that gold disc / out of its well? / (Each phrase braids cable.) // Invisible conductor, / stay in your groove.” It would be untrue to claim that the final poems of Elise Partridge point in some ground-breaking direction that her death has robbed us of. Like the rest of her Collected, they are simply solid poems that point, if anywhere, back into the shared histories of poetry and language, and that is our true loss: a poet with a clear-eyed sense of her tradition and how that tradition also rides the edge of the future. In the end we’re left with the work. And it shines.